We have four distinct wedding venues including our Grand Ballroom, Jasmine Room, Jimbaran Garden & Swimming Pool. We offer several customized wedding packages to suit every style and budget. How much does a wedding at AYANA MidPlaza JAKARTA cost? There are many wedding packages to choose from to suit your personal budget. Please contact our Wedding Specialist who will assist you to plan a beautifully enchanting day in an exquisite destination. How much time prior to my wedding date should I start preparations? At least 6 months prior to your wedding date is ideal to secure your booking and commence preparations. Subject to availability, AYANA Midplaza JAKARTA may also accommodate requests within a one-month time frame. Who will assist me with preparations? A dedicated Wedding Specialist is personally appointed to manage and orchestrate your special day and is assigned to you from your initial inquiry until your fond farewell as a married couple. We have shortlisted wedding vendors, which can be utilized as a reference to help make your dream wedding a reality at AYANA. For outdoor ceremony venues, wet weather alternatives such as our luxuriously-appointed Jasmine Room, or Scusa, are available. Tents are also available upon request with anadditional charge. Will I need a wedding rehearsal? Your personal wedding specialist recommends a final meeting, walk through and briefing the day prior to your wedding if this is suitable to the bride and groom. Does AYANA Midplaza JAKARTA have any partnership with AYANA Resort and Spa BALI? Yes, AYANA Midplaza JAKARTA is the sister hotel of AYANA Resort and Spa BALI. Celebrate your wedding at AYANA Midplaza Jakarta and we'll elevate your experience with VIP benefits available at sister AYANA properties. 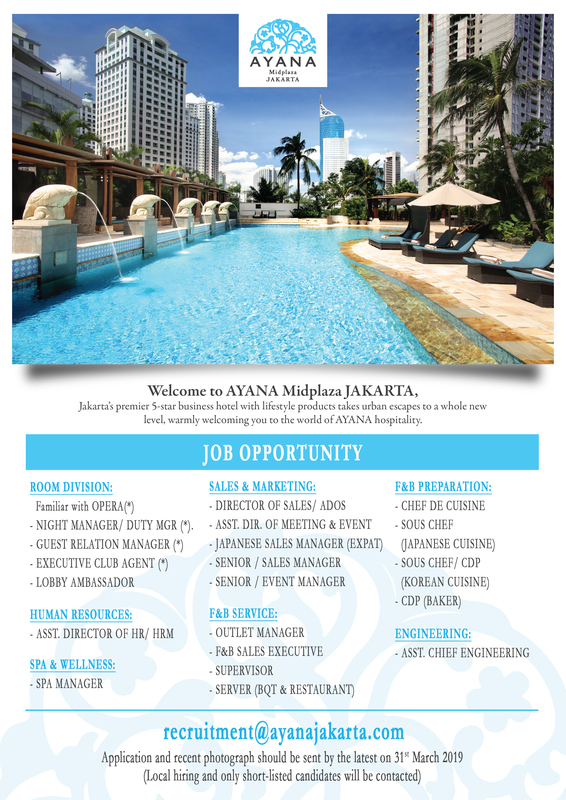 Will AYANA Midplaza JAKARTA assist us to arrange all benefits related to AYANA Resort and Spa BALI? Yes, our professional and friendly event team will assist you to arrange all of your benefits with AYANA Resort and Spa BALI. What benefits do I receive if I celebrate my wedding at AYANA Midplaza JAKARTA? When you celebrate your wedding at AYANA Midplaza JAKARTA, you'll enjoy a complimentary photo shoot at AYANA Resort and Spa BALI, a one-night stay at AYANA Resort and Spa BALI, luxury wellness treatment for two at SPA on The Rock, complimentary Aquatonic spa session, and a candlelight dinner for two. Your benefits will depend on the wedding package you choose. Who should I contact when I want to have my wedding at AYANA Midplaza JAKARTA?